Having to deal with a stripped screw is one of the most common issues faced when carrying out a repair. And boy are they annoying! Makes your blood boil just thinking about one, right? We aim to help, we have produced this guide, with accompanying video, to give you 6 ways to remove a stripped screw. The first 3 ways involve items you should have at home, then move onto more specialist tools. By the end of reading, viewing, this guide you will be well prepared for the next time you go into battle with a stripped screw. So here they are, enjoy! Make sure you always wear the appropriate safety gear for the task that is being carried out. This method works best when the screw isn't completely stripped and you just need to give the screw driver something extra to grip into. Tear of a piece of duct tape, lay it on top of the screw head. Next get your screw driver and press it firmly in. Slowly remove the screw whilst maintaining downward pressure. If you don't have duct tape then you can try other types such as masking or normal sellotape. This works in the same way as the duct tape, the band is placed on top of the screw and firmly press the screw drive in. Remove the screw with consistent, firm downward pressure. This method is great if the stripped screw is protruding out of the wood. Get a pair of locking pliers, grip on to the screw head. And rotate anticlockwise to remove the screw. If you don't have locking pliers then other types will work, just need to make sure you get a firm grip. Now things start to get more serious! For this method you need to get an impact driver and a hammer. Impact drivers, if you don't already have one, are readily available from most DIY stores or on the internet. Fit the correct bit to the end of the driver and place into the screw head.Take the hammer and hammer the top of the driver. You need to be controlled but use a good bit of force. The action of hammering the driver rotates the bit and should loosen the screw. Once the screw is loosened you can then remove with a normal screw driver. Again this works OK if the screw head isn't entirely stripped. This is a really good method if the screw is completely stripped. You need to get a small electric drill with a cutting disc attachment. Use the drill/disc to cut a notch into the top of the screw. Make sure it is nice and deep. Then take a flat headed screw driver and simply remove the screw. Works well on screws of all sizes, but care needs to be taken not to damage the surrounding area with the disc. 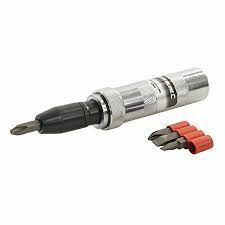 A screw extractor is a tool specifically designed for removing stripped screws. To use one you will need an electric drill. The extractor is double ended. One end is for drilling a hole into the screw, and the other for removing the screw. The first step is to use the drill end to drill a hole into the end of the screw, make sure it is a relatively deep hole. You then change the extractor around, put the drill into reverse and place it into the hole you drilled. Apply firm downward force on the drill and rotate it very slowly anti clockwise. The extractor should grip into the screw head and the screw should start to be turn. Keep going until the screw is all o the way out. We found the screw extractor worked really well, but you do need to take your time and don't rush it. You are now well prepared for the next time you meet your nemesis, the stripped screw! For producing this guide and video we were demonstrating on screws in wood. So we could be quite rough. Obviously if you are removing a stripped screw from a piece of equipment that is more delicate, such as electronic items, then you need to take your time and not use so much force. Contribute We are always on the lookout for people who want to contribute to the help section of our site. If you are a keen fixer and want to share your knowledge then please get in contact, we would love to have your helps.